The only national-scale digital geologic maps that portray most or all of the United States for the conterminous U.S. are the digital version of the King and Beikman (1974a, b) map at a scale of 1:2,500,000, as digitized by Schruben and others (1994) and the digital version of the Geologic Map of North America (Reed and others, 2005a, b) compiled at a scale of 1:5,000,000 which is currently being prepared by the U.S. Geological Survey. The present series of maps is intended to provide the next step in increased detail. State geologic maps that range in scale from 1:100,000 to 1:1,000,000 are available for most of the country, and digital versions of these state maps are the basis of this product. In a few cases, new digital compilations were prepared (e.g. OH, SC, SD) or existing paper maps were digitized (e.g. KY, TX). For Alaska and Hawaii, new regional maps are being compiled and ultimately new state maps will be produced. The digital geologic maps are presented in standardized formats as ARC/INFO (.e00) export files and as ArcView shape (.shp) files. Accompanying these spatial databases are a set of five supplemental data tables that relate the map units to detailed lithologic and age information. The maps for the CONUS have been fitted to a common set of state boundaries based on the 1:100,000 topographic map series of the United States Geological Survey (USGS). When the individual state maps are merged, the combined attribute tables can be used directly with the merged maps to make derivative maps. No attempt has been made to reconcile differences in mapped geology across state lines. 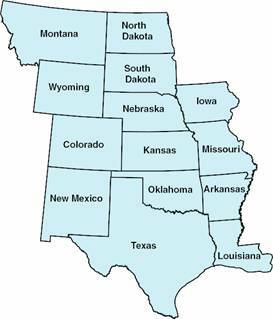 This is the first version of this product and it will be subsequently updated to include four additional states (North Dakota, South Dakota, Nebraska, and Iowa) as shown in the map above. The various digital geologic maps that form the basis for this product were originally produced in a wide variety of formats. Although most of them are available as ARC/INFO export (.e00) files and/or ArcView shape files, the items and formats in the polygon (PATs) and arc (AATs) attribute tables vary dramatically. To unify these disparate maps, it was necessary to create a set of standard formats, and then to convert the state digital geologic maps to conform to these standards. The details of these standards are presented in the documentation of this report. The creation of a unique map unit name, called unit_link, allows the different State maps to be merged. (Database field names are in italics). Unit_link consists of the two-letter State (ST) abbreviation, concatenated with the original geologic map unit symbol, which may be slightly modified to remove special characters for age designations, followed by a semicolon, and an integer that designates geographic regions (or provinces) within the map. For those states where provincial structure is absent, this integer is "0". This variable, unit_link, can then be used as a key field to relate the tables that contain age and lithologic information to the spatial database. Spatial databases are provided in both Lambert Conformal Conic projection and decimal degrees. Supplemental attribute tables are provided in Filemaker Pro format (.fp5), in dBase format (.dbf), and comma-separated value (.csv) text. Some of the fields in this database contain large amounts of information, and this may result in some complications. The dbf format restricts each field to a maximum width of 255 characters and therefore fields are truncated beyond 255 characters. The csv format has no such size restriction, but most GIS software will not display fields beyond 255 characters. The paper map of Montana (Ross, Andres, and Witkind, 1955) is at a scale of 1:500,000. It was compiled as a cooperative venture between the U.S. Geological Survey and the Montana Bureau of Mines and Geology. This map is currently out of print. A digital representation of this map (Raines and Johnson, 1995) is available from the USGS at http://pubs.usgs.gov/of/1995/ofr-95-0691. The original coverage boundary was replaced with the standardized common state boundary. The paper and the digital map were both released as two sheets. The two digital halves were stitched together with the overlap removed to create one database. The Montana digital source data was not changed in any additional way. No additional polygons were created from the use of the standardized state border. The only arc changes were to close polygons or delete overshoots. Text file(s) containing FGDC-compliant metadata for Montana files. The paper map of Wyoming (Love and Christiansen, 1985) is a scale of 1:500,000 and is available from the U.S. Geological Survey. A digital version of this map (Green and Drouillard, 1994) is available from the USGS at http://pubs.usgs.gov/of/1994/ofr-94-0425. The original coverage boundary was replaced with the standardized common state boundary. The Wyoming digital source data was not changed in any additional way. No additional polygons were created from the use of the standardized state border. The only arc changes were to close polygons or delete overshoots. Text file(s) containing FGDC-compliant metadata for Wyoming files. The paper map of Colorado (Tweto, 1979) is at a scale of 1:500,000. This map is usually available from the U.S. Geological Survey. A digital version of this map (Green, 1992) is available from the USGS at http://pubs.usgs.gov/of/1992/ofr-92-0507. The original coverage boundary was replaced with the standardized common state boundary. The Colorado digital source data was not changed in any additional way. No additional polygons were created from the use of the standardized state border. The only arc changes were to close polygons or delete overshoots. Text file(s) containing FGDC-compliant metadata for Colorado files. The paper Geologic map of New Mexico (New Mexico Bureau of Geology and Mineral Resources, 2003) is at a scale of 1:500,000. The paper map is based on The Digital Geologic Map of New Mexico in Arc/Info Format (Green and Jones, 1997). This digital map was based upon the earlier digital Geologic Map of New Mexico (Anderson and Jones, 1994). The paper version is available from the New Mexico Bureau of Geology and Mineral Resources and the U.S. Geological Survey. The 1997 digital version is available at http://pubs.usgs.gov/of/1997/ofr-97-0052/. The 1994 digital version is available from the New Mexico Bureau of Geology and Mineral Resources. The original coverage boundary was replaced with the standardized common state boundary. The New Mexico digital source data was not changed in any additional way. No additional polygons were created from the use of the standardized state border. The only arc changes were to close polygons or delete overshoots. Text file(s) containing FGDC-compliant metadata for New Mexico files. The original coverage boundary was replaced with the standardized common state boundary. Two polygon labels were changed to match the paper 1980 geologic map. These two polygons now have a source equal to ND002 (in the “source” field of the Polygon Attribute Table, PAT). The North Dakota digital source data was not changed in any additional way. No additional polygons were created from the use of the standardized state border. The only arc changes were to close polygons or delete overshoots. Text file(s) containing FGDC-compliant metadata for North Dakota files. The Geologic Map of South Dakota (Martin, Sawyer, Fahrenbach, Tomhave, and Schulz, 2004) was released as an Adobe Acrobat PDF formatted digital graphic as General Map 10 (at the South Dakota Geological Survey web site, http://www.sdgs.usd.edu/digitalpubmaps/general.html). This map is at a scale of 1:500,000. The data base for this publication is also available from the same web site in shapefile format. The original coverage boundary was replaced with the standardized common state boundary. No additional polygons were created from the use of the standardized state border. The only arc changes were to close polygons or delete overshoots. In order to create a topologically structured Arc/Info coverage from the shapefiles, minor editing was required. Overlapping contacts, especially along shorelines, were deleted. The PDF geologic map clearly show fault traces, however these faults are not included with the South Dakota web site shapefile dataset. As part of cooperative work in preparing the new South Dakota state map these faults were originally digitized by the U.S. Geological Survey (Nancy Shock, USGS, personal communications, 2004). The authors edited this pre-release fault map layer to match the published PDF graphic. This fault layer is included here as SDfaults_lcc and SDfaults_dd in both export and shapefile formats. Text file(s) containing FGDC-compliant metadata for South Dakota files. The paper map of Geologic Bedrock Map of Nebraska (Burchett, 1986) is at a scale of 1:1,000,000. This map is available from the Nebraska Geological Survey, Conservation and Survey Division, University of Nebraska-Lincoln at https://marketplace.unl.edu/nemaps/catalogsearch/result/?q=bedrock+map. A digital version of this map is available on line (Nebraska Geological Survey, 1996) at http://snr.unl.edu/data/geographygis/geology.aspx. The original coverage boundary was replaced with the standardized common state boundary. The Nebraska digital source data was not changed in any additional way. No additional polygons were created from the use of the standardized state border. The only arc changes were to close polygons or delete overshoots. Text file(s) containing FGDC-compliant metadata for Nebraska files. The paper map of Kansas (Ross, 1991) is a scale of 1:500,000 and is available from the Kansas Geological Survey. A digital version of this map (Ross, 1992) is available from the KGS at http://gisdasc.kgs.ku.edu/. The original coverage boundary was replaced with the standardized common state boundary. The Kansas source data was released as 105 separate county covers. These were stitched together to recreate the state map. Two arcs were coded as contacts and 340 arcs were coded as shoreline. No additional polygons were created. The only arc topology changes were to close polygons or delete overshoots. The digital geologic map was released with a marker bed feature layer. Unfortunately, the marker or formation base layer for Crawford County is not available. These data were digitized from a paper library copy of the Kansas geologic map and added to the feature layer. The Cretaceous age symbol K was added to the Cretaceous igneous rock labels for logical consistency. In the Kansas geology polygon coverage and Filemaker Pro attribute table, the symbol for Kimberlite is now KK, the Rose Dome Lamproite is KRD, and the Silver City Dome Lamproite is KSC. Text file(s) containing FGDC-compliant metadata for Kansas files. The digital geologic map of Oklahoma (Heran, Green, and Stoeser, 2003) is a compilation of nine 1:250,000 scale geologic quadrangle maps and three 1:125,000 scale county maps. This dataset was developed to provide a digital geologic map database for Oklahoma since no such database was publicly available. This database is freely available from the USGS at http://pubs.usgs.gov/of/2003/ofr-03-247/. The original coverage boundary was replaced with the standardized common state boundary. The Oklahoma digital source data was not changed in any additional way. No additional polygons were created from the use of the standardized state border. The only arc changes were to close polygons or delete overshoots. Text file(s) containing FGDC-compliant metadata for Oklahoma files. The paper map of Texas (Barnes, 1992) is a scale of 1:500,000 and is available from the Bureau of Economic Geology, The University of Texas at Austin, Texas. A digital version of this map (Stoeser, Shock, Green, Dumonceaux, and Heran, in press) will be available from the USGS at http://pubs.usgs.gov/ in the Data Series directories. The original coverage boundary was replaced with the standardized common state boundary. The Texas digital source data was not changed in any additional way. No additional polygons were created from the use of the standardized state border. The only arc changes were to close polygons or delete overshoots. Text file(s) containing FGDC-compliant metadata for Texas files. The paper Geologic map of Iowa (Iowa Geological Survey, 1969) is at scale of 1:500,000. The paper map was available from the Iowa Geological Survey but it is now out of print. A digital version (Hoyer, 1989) is available from the Iowa Geological Survey at ftp://ftp.igsb.uiowa.edu/gis_library/IA_state/Geologic/Bedrock/Bedrock_geology.zip. The original coverage boundary was replaced with the standardized common state boundary. The Iowa digital source data was not changed in any additional way. No additional polygons were created from the use of the standardized state border. The only arc changes were to close polygons or delete overshoots. Text file(s) containing FGDC-compliant metadata for Iowa files. The paper Geologic map of Missouri (Middendort, 2003) is at a scale of 1:500,000 and is available from the Missouri Department of Natural Resources. A digital version of this map (Missouri Department of Natural Resources, 2005) is available from at http://msdisweb.missouri.edu/datasearch/ThemeList.jsp. The original coverage boundary was replaced with the standardized common state boundary. No additional polygons were created from the use of the standardized state border. One arc was added and coded as a contact to resolve a topology problem. Arcs were extended and overshoots deleted in order to use the standardized state border. The paper map has point features. Unfortunately, the digital version did not. These data were digitized from a paper library copy of the Missouri geologic map and added to a point layer. Text file(s) containing FGDC-compliant metadata for Missouri files. The paper Geologic map of Arkansas (Haley and others, 1993) is at a scale of 1:500,000 and is available from the U.S. Geological Survey. A digital version of this map (United States Geological Survey, 2000) is available from http://pubs.usgs.gov/sm/arkansas/download/finished/. The original coverage boundary was replaced with the standardized common state boundary. No additional polygons were created from the use of the standardized state border. Arcs were extended and overshoots deleted in order to use the standardized state border. Contacts that were in fact shorelines were recoded as such. Text file(s) containing FGDC-compliant metadata for Arkansas files. The paper map of Louisiana (Snead and McCulloh, 1984) is a scale of 1:500,000 and is available from the Louisiana Geological Survey. A digital version of this map (United States Geological Survey, Biological Research Division's, National Wetlands Research Center, 1998) is available at http://www.nwrc.usgs.gov/. The original coverage boundary was replaced with the standardized common state boundary. The Louisiana digital source data was not changed in any additional way. No additional polygons were created from the use of the standardized state border. The only arc changes were to close polygons or delete overshoots. The original paper geologic map had geologic faults clearly shown. Unfortunately, the digital version did not. These data were digitized from a paper library copy of the Louisiana geologic map and added to a fault layer. Text file(s) containing FGDC-compliant metadata for Louisiana files. Anderson, O.J., and Jones, G.E., 1994, Geologic Map of New Mexico: New Mexico Bureau of Mines and Mineral Resources, Open-file Report 408-A and B, Geologic map and 15 magnetic disks, 1:500,000. Barnes, V.E., compiler, 1992, Geologic Map of Texas: Bureau of Economic Geology, The University of Texas at Austin, 4 sheets, scale 1:500,000. Burchett, R.R., 1986, Geologic Bedrock map of Nebraska: Nebraska Geological Survey, Conservation and Survey Division, University of Nebraska-Lincoln, Lincoln, Nebraska, scale 1:500,000. Clay, Lee, 1990, Geologic Map of North Dakota: North Dakota Geological Survey, Bismark, North Dakota, scale 1:500,000. Conservation and Survey Division, University of Nebraska-Lincoln (CSD), 1996, bedrock.e00: Nebraska Geological Survey, Conservation and Survey Division, University of Nebraska-Lincoln, Lincoln, Nebraska, scale 1:500,000, http://csd.unl.edu/csd-esic/gisdata/bedrock.e00. Green, G.N., 1992, The Digital Geologic Map of Colorado in ARC/INFO Format: U.S. Geological Survey Open-File Report 92-0507, 9 p.; http://pubs.usgs.gov/of/1992/ofr-92-0507. Green, G.N., and Drouillard, P.H., 1994, The Digital Geologic Map of Wyoming in ARC/INFO Format: U.S. Geological Survey Open-File Report 94-0425, 10 p.; http://pubs.usgs.gov/of/1994/ofr-94-0425. Green, G.N., and Jones, G.E., 1997, The Digital Geologic Map of New Mexico in ARC/INFO Format: U.S. Geological Survey Open-File Report 97-0052, 9 p.; http://pubs.usgs.gov/of/1997/ofr-97-0052. Haley, B.R., assisted by Glick, E.E., Bush, W.V., Clardy, B.F., Stone, C.G., Woodward, M.B., and Zachry, D.L.,1993, Geologic map of Arkansas, U.S. Geological Survey, scale 1:500,000. Heran, W.D., Green, G.N., and Stoeser, D.B., compilers, 2003, A Digital Geologic Map Database for the State of Oklahoma: U.S. Geological Survey Open-File Report 03-247.; http://pubs.usgs.gov/of/2003/ofr-03-247/. Hoyer, Bernard, 1989, Bedrock Geology of Iowa: Iowa Department of Natural Resources, Iowa City, Iowa, scale 1:500,000,; ftp://ftp.igsb.uiowa.edu/gis_library/IA_State/Geologic/Bedrock/bedrock_geology.zip. Iowa Geological Survey, 1969, Geologic map of Iowa: Iowa Geological Survey, Iowa City, Iowa, scale 1:500,000. Love, J.D., and Christiansen, A.C., 1985, Geologic Map of Wyoming: U.S. Geological Survey Special Geologic Map, scale 1:500,000. Martin, J.E., Sawyer, J.F., Fahrenbach, M.D., Tomhave, D.W., and Schulz, L.D., 2004, Geologic map of South Dakota: South Dakota Geological Survey, Vermillion, South Dakota, scale 1:500,000,; http://www.sdgs.usd.edu/digitalpubmaps/general.html. Middendorf, M.A., 2003, Geologic map of Missouri, Sesquicentennial Edition; Missouri Department of Natural Resources, scale 1:500,000. Missouri Department of Natural Resources, Geological Survey and Resource Assessment Division, 2005, Bedrock geology, State of Missouri: Missouri Department of Natural Resources. ; http://msdisweb.missouri.edu/datasearch/ThemeList.jsp. New Mexico Bureau of Mines and Mineral Resources, 2003, Geologic Map of New Mexico: New Mexico Bureau of Mines and Mineral Resources, scale 1:500,000. Raines, G.L. and Johnson, B.R., 1995, Digital representation of the Montana stage geologic map: a contribution to the Interior Columbia River Basin Ecosystem Management Project: U.S. Geological Survey Open-File Report 95-691, 21 p.; http://pubs.usgs.gov/of/1995/ofr-95-0691. Ross, C.P., Andres, D.A., and Witkind, I.J., 1955, Geologic map of Montana: U.S. Geological Survey Special Geologic Map, 2 plates, scale 1:500,000. Ross, J.A., 1991, Geology Map of Kansas: Kansas Geological Survey, Map M-23, 1:500,000 scale. Ross, J.A., 1992, A digital representation of the Geology map of Kansas: Map -23, Kansas Geological Survey, scale 1:500,000; http://gisdasc.kgs.ku.edu/. Snead, J.I. and McCulloh, R.P., 1984, Geologic map of Louisiana: Louisiana Geological Survey, scale 1:500,000. Stoeser, D.B., Shock, Nancy, Green, G.N., Dumonceaux, G. M., and Heran, W.D., in press, A Digital Geologic Map Database for the State of Texas: U.S. Geological Survey Data Series. Tweto, Ogden 1979, Geologic Map of Colorado: U.S. Geological Survey Special Geologic Map, scale 1:500,000. United States Geological Survey, 2000, The Geologic map of Arkansas, Digital Version: U.S. Geological Survey. ; http://cpg.cr.usgs.gov/pub/other-maps.html. United States Geological Survey, 1998, Digital Overlay of the Geologic map of Louisiana: U.S. Geological Survey, Biological Research Division, National Wetlands Research Center, Product Id USGS-NWRC 1984-02-0001, http://www.nwrc.usgs.gov/. Waldkirch, R.P., 1997, Geology for North Dakota: North Dakota Geological Survey – GIS Lab, Bismark, North Dakota, scale, 1:500,000,; http://gis1.state.nd.us/500k/geology/nd_bedrock.zip.